Planning at a metropolitan scale is important for effective management of urban growth, transportation systems, air quality, and watershed and green-spaces. It is fundamental to efforts to promote social justice and equity. Best Practices in Metropolitan Transportation Planning shows how the most innovative metropolitan planning organizations (MPOs) in the United States are addressing these issues using their mandates to improve transportation networks while pursuing emerging sustainability goals at the same time. As both a policy analysis and a practical how-to guide, this book presents cutting-edge original research on the role accessibility plays - and should play - in transportation planning, tracks how existing plans have sought to balance competing priorities using scenario planning and other strategies, assesses the results of various efforts to reduce automobile dependence in cities, and explains how to make planning documents more powerful and effective. In highlighting the most innovative practices implemented by MPOs, regional planning councils, city and county planning departments and state departments of transportation, this book aims to influence other planning organizations, as well as influence federal and state policy discussions and legislation. 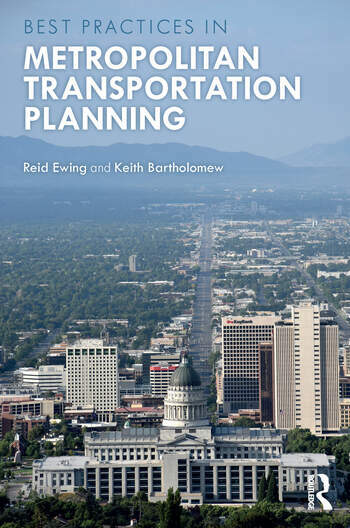 Reid Ewing is chair of the Department of City and Metropolitan Planning at the University of Utah, USA, associate editor of the Journal of the American Planning Association, and columnist for Planning magazine. Ewing’s nine books and over 100 peer-reviewed articles are aimed at planning practitioners. Keith Bartholomew is an Associate Dean and Associate Professor at the University of Utah College of Architecture + Planning, USA. Professor Bartholomew previously served as a staff attorney for 1000 Friends of Oregon and was the director of "Making the Land Use, Transportation, Air Quality Connection".